Autodefensas of Guerrero discovered seven additional clandestine graves (fosas) today in Iguala, so far they have found bodies in 4 but did not give a tally today. Miguel Ángel Jiménez Blanco, head of the search committee, Unión de Pueblos and Organizaciones del Estado de Guerrero (UPOEG), indicated the fosas were near a hill in the El Zapatero area. He states they expect to find many more graves but the process is slow because they only have picks and shovels, no heavy duty equipment. The question begs to be asked, how is it the authorities are not finding any and they have the heavy duty equipment and tools? The National Human Rights Commission (CNDH) launched an investigation into the bodies found in different graves in a place known as Las Parotas in Iguala. The agency, seeks to understand the actions taken by the Mexican State to identify victims and what they are doing to locate those responsible for the deaths. In a statement of 14 October, CNDH stated that the autodefensas, located an area of land containing bones. 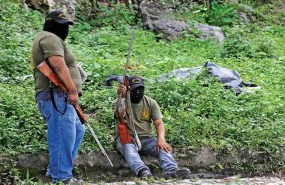 "Of particular concern is the situation of public insecurity in the State of Guerrero," he said. and that there is no justification for authorities not to make it a priority to implement necessary measures to search for the missing students and additional graves . Since Monday, Argentine experts are seeking DNA testing of relatives of missing youths matched to the discovered remains; however, the Attorney General of Guerrero and the Attorney General's Office (PGR) have blocked their work, and they have not been allowed to access to the bodies found in clandestine graves of Iguala. Relatives of the 43 students of the Ayotzinapa rural school who disappeared on September 26th accused the Federal government of Guerrero of the hindering Argentine forensic team of anthropologists to conduct investigations in Iguala. At a press conference, Meliton Ortega , Mauricio Ortega's father, expressed his distrust of official investigations, since "the government is colluding with organized crime" after all it was " was the police. Not narcos" who attacked the students. Why is the guerrero state government still blocking anything? Totally disgusting ie.Mexican Government.Arent they embarrassed at the way they treat the relatives.Guess it takes second seat to what they are trying to hide.They know where the students are but they don't want them found and I don't think they are alive or they would have been released by now. The authorities of Iguala know where the student's bodies are?They are playing a game again,wait and see,let the heat escape from the news of students kidnapped and horribly murdered..The sense of frustration of the family members must be indescribable?Course they know where they are,their police did it? Gov doesnt want to cofirm deaths. They prefer them dissapeared.